Lived in the Dand District. He was known as "Laughing Jack". They la ter (ca. 1936) moved to Dryden, Ontario. They are buried there. • 1871 Census of Canada: John, age 6, with father Hugh, age 35, mother Mary Jane, age 29, and s, 2 Apr 1871. 218 iblings Sarah E., age 7, Joseph, age 3, and Hugh, age 6 months. John, age 6, with father Hugh, age 35, mother Mary Jane, age 29, and s iblings Sarah E., age 7, Joseph, age 3, and Hugh, age 6 months, an d a C. Angus McKinnin, age 16, from Ontario. 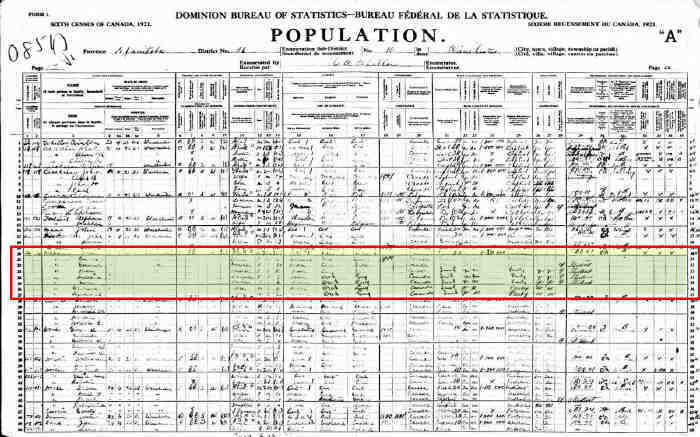 • 1881 Census of Canada: John, age 15, with father Edward, age 40, mother Mary, age 39, and sib, 4 Apr 1881. 292 lings Samuel, age 16, Joseph, age 12, Hugh, age 10, William, age 9, Ed ward, age 6, and Richard, age 5. John, age 15, with step-father Edward, age 40, mother Mary Jane (Tiffi n-McBurney), age 39, and siblings Samuel, age 16, Joseph, age 15, Hugh , age 10, William, age 9, Edward, age 6, and Richard, age 5. Samuel, William, and Edward are from Edward's marriage to Catherine Jo hnstone. John, Joseph, Hugh, and Richard are from Mary Jane's marriage to Hug h McBurney. 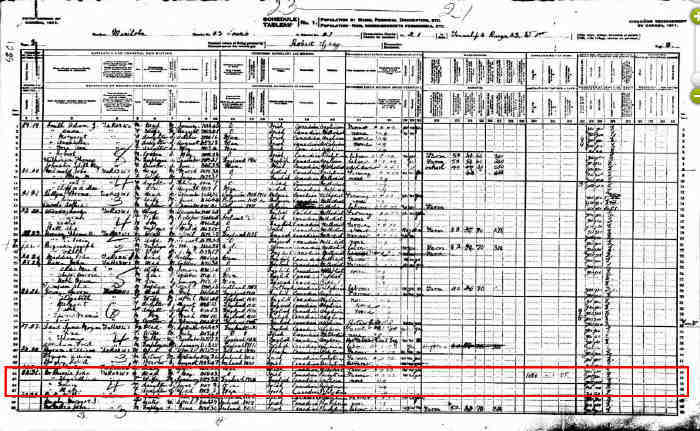 • 1911 Census of Canada: John, age 43, with wife Elizabeth Jane, age 32, and daughters Emily, a, 1911. 326 ge 3, and Mary, age 2. John, age 43, with wife Elizabeth Jane, age 32, and daughters Emily, a ge 3, and Mary, age 2. 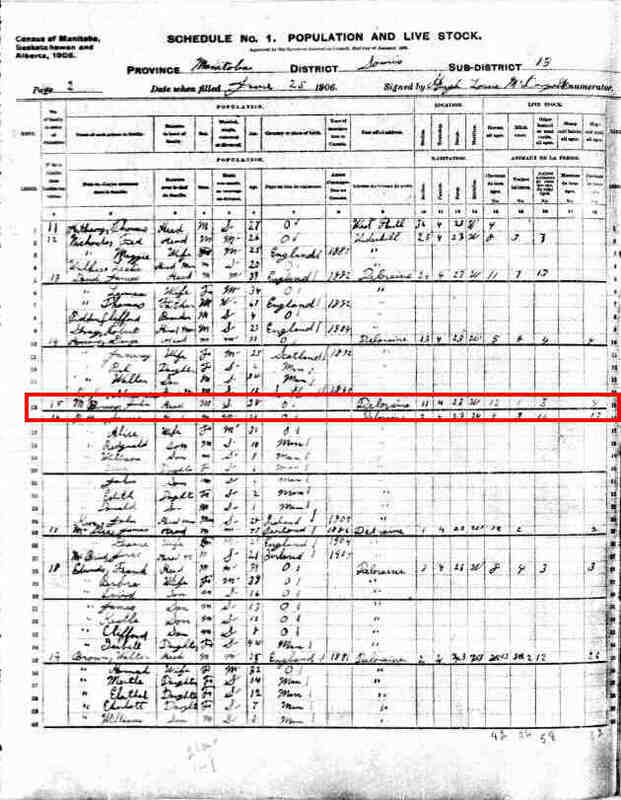 • 1916 Census of Canada (Manitoba, Saskatchewan, and Alberta): John, age 51, with wife Elizabeth Jane, age 34, and children Emily Jan, 1916. 327 e, age 9, Mary, age 7, Lillian, age 3, and Eva, age 1. John, age 51, with wife Elizabeth Jane, age 34, and children Emily Jan e, age 9, Mary, age 7, Lillian, age 3, and Eva, age 1. 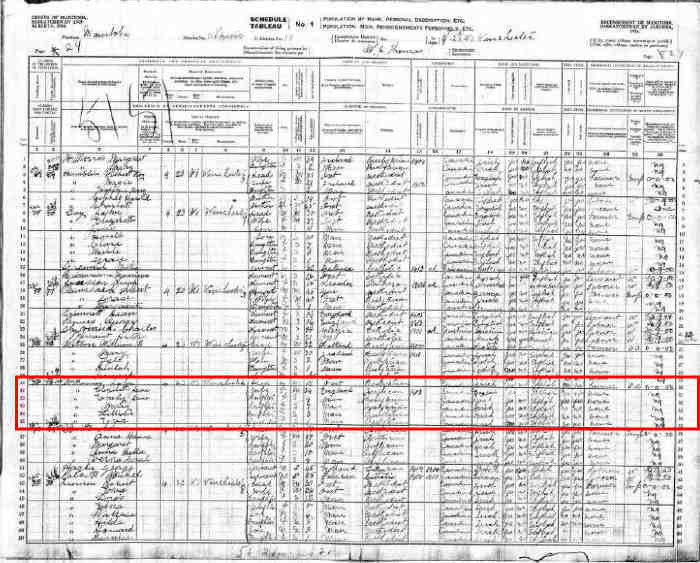 • 1921 Census of Canada: John, age 56, with wife Elizabeth, age 40, and children Eunice ? (Emil, 1921. 328 y), age 14, Mary, age 12, Lillian, age 9, Eva, age 6, William J., ag e 3, and Richard, age 1 month. John, age 56, with wife Elizabeth, age 40, and children Eunice ? (Emil y), age 14, Mary, age 12, Lillian, age 9, Eva, age 6, William J., ag e 3, and Richard, age 1 month.